A multidisciplinary team delivers the most effective end result. For an environmental branding project to succeed it is important for the project to be examined from multiple perspectives with each team member bringing a unique viewpoint to the table. A well-rounded team should consist of individuals who can provide insight from a variety of areas of expertise. "We are a team of many skills, and each team member has viewpoints that contribute to creating a more holistic and meaningful design," explains John deWolf RGD, Vice President of Form:Media. "For example, we are working on a mixed-use residential development where, in addition to designing the building itself, deliverables include a name for the property, a logotype and exterior and interior building signage. Our Experiential Graphic Design (EGD) group works together with the teams in charge of interior, exterior and landscape architecture at every step of the process. Every decision will be guided by a core idea that is developed by all of the teams together." lg2 takes a similar approach, bringing together team members who can share expertise to create a unique brand experience. "The brand strategist acts as the guardian who makes sure that each decision is coherent with the brand’s positioning and personality. The graphic designer, creative director, interior designer and architect collaborate throughout the entire creative process to develop the project’s graphical and architectural language," explains Claude Auchu, Partner and CEO. "No single expertise is valued more than any other. For us, each one helps create distinctive, successful projects for our client." As Debbie Adams RGD (A+A Design) points out, the involvement of an environmental graphic designer at the outset of a project can help ensure a unified design vision from the start, but it also helps when all team members recognize the importance of that vision. "It is my experience that architects and interior designers who regularly integrate environmental graphic design into their work typically provide well-considered opportunities for its integration into the project," she says. For A+A Design's work on the Toronto Birth Centre, the successful collaboration between the client, architect, lighting specialist, contractor and graphics fabricators came from understanding the goals of each team member and how they supported each other. Working with a team that includes designers as well as architects is the best way to ensure that each element of the space is serving the brand. "While architects can certainly create signage and graphics, choose materials, etc., the brand tends to take a back seat unless it is someone’s responsibility to focus on it," says Joseph Duffy, DUFFY & Partners. "Designers and architects working together throughout the process will ensure the end result is an integrated and successful one." To bring the American Eagle brand to life within their new corporate campus, the team started with their Mission Statement and brand promise, creating a visual brief to show how it could be executed in environmental applications. Working hand-in-hand with the client and the architectural firm, the team shared and modified ideas based on their areas of expertise. The design honours the historic roots of the neighbourhood, which was once home to the city's steel milling district. 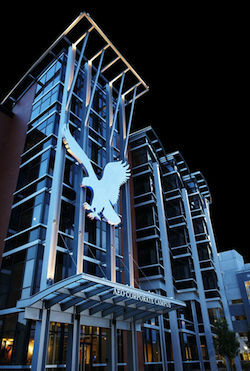 Raw building materials such as steel girders and concrete were interpreted in modern ways to help convey American Eagle’s commitment to Pittsburgh as well as to their brand mantra, Live Your Life. Another goal of the project was to ensure the environment was people-centric. Imagery of actual employees was used throughout the space, using the brand logo as an artful framing device.